30th July to 1st August, Spanish summer camp will be organised by the Federación Kyokushinkai España Shinkyokushinkai. The Spanish camp have a good tradition to offer the best guest instructors, and this year it is no different than it used to be. 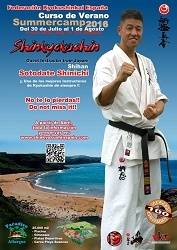 Shihan Shinichi Sotodate 5th Dan from Japan. Sotodate Shihan is one of the hardworking instructors from WKO Japan that spread Shinkyokushin Karate around the world. With a long history and experience, there is much to be learned from this instructor. -but that’s not all, Sotodate Shihan is a Charismatic Budo practitioner who adds something extra you have to experience to understand. And he is WKO Board and technical committee member, Branch-Chief Hokaido.